Divorce can be stressful, confusing and sad for children. Kids usually feel uncertain or furious at the prospect of their mother and father splitting up. As a parent, helping your kids cope with this process is essential by maintaining stability at home and attending to your children's needs. It definitely won't be a flawless process, but there are certain things that you can do to ease the process. • Keep visible conflict, legal talks and heated discussions away from your children. • Make sure your child understands that divorce is only between adults and that he or she did nothing to cause the divorce. • Expect a mix of reactions from your child, for example, a resurgence of separation anxiety could strike, eventually the reality of divorce will settle in. • An older child may respond to the stress at home with anger, grief, anxiety and sometimes, even relief. Make it a point to encourage your child to share his or her feelings as openly as possible because if your child's anger turns inwards, he or she might become depressed or withdrawn. • Don't force your child to choose sides and never use your child as a pawn to hurt the other parent. • Don't speak ill about your spouse to your child. • During divorce, kids benefit from one-on-one time with each parent. No matter how inconvenient, make an effort to accommodate your ex-partner as visitation schedules. • Emotional concerns, loss, and hurt following divorce can take a while to heal which often happens in phases, so be patient with yourself and with your child. • Get help dealing with your own painful feelings about the divorce. It will take some time for your kids to work through their issues about divorce, but you should see gradual improvement over time. If things get worse several months after the divorce, this may be a sign that your child is stuck in anxiety, depression, anger and could use additional support. 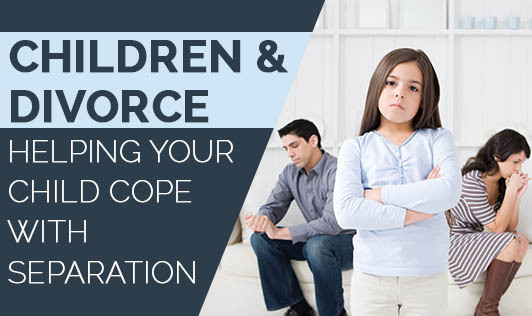 You can discuss these or any other divorce related warning signs that you may have noticed with your child's doctor and seek guidance on coping with specific problems. Remember that changes of any kind are hard. Finding your inner strength and getting help to learn new coping skills are definitely hard work, but these can make a very big difference to helping your family get through this difficult time.